As we're boarding Coast Starlight #11 southbound from Klamath Falls, the December night is dark and the temperature below freezing. It's a good time to be heading south! Car #1130's attendant Bonnie says, "I've got your bedroom all ready," and directs us upstairs to Superliner Bedroom D.
Ted remarks, "That was easy! I didn't have to take my shoes off!" Our cozy bedroom with its fresh white sheets and extra blankets is aglow with just the reading lights turned on. Travel Tip: Sleeping cars ending with the number zero will be next to the dining car on most trains. On this one, they will be adjacent to the Pacific Parlour Car; the dining car is next to that. The muted sound of the whistle and the music of the rails lull us to sleep. 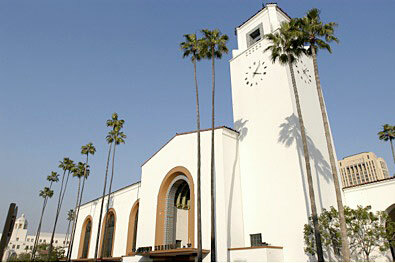 We awake the next morning at the Spanish-style station at Davis, surrounded by California palm trees. In years past, the countryside between Davis and Martinez was marked by the green hills to the west, an occasional swamp, and some farm buildings. But each time we take #11 now, we observe more of California's growth. Soon we're surrounded by warehouses, festooned by graffiti applied on top of other graffiti, construction equipment, yards full of dead automobiles, and just plain junk. Enormous dirt fills have relocated the shoreline of the bay quite a ways from the tracks, where we used to see waves lapping and morning fisherman at the shore. Travel Tip: There are a number of reasons why, if one is making a one-way trip, to choose northbound Coast Starlight #14. Not only is this industrial wreckage hidden by darkness on the northbound train, but one wakes up in a whole new world of forested high desert, not visible going the other direction. Passengers on #14 see sunrise over the glaciers of gigantic Mt. Shasta along with their morning coffee as the rails wind across its shoulder. North of Klamath Falls, the tracks run along Upper Klamath Lake (look for bald eagles and white pelicans) as the other Cascade volcanoes come into view. Root Beer Falls splashes to the bottom of a gorge. 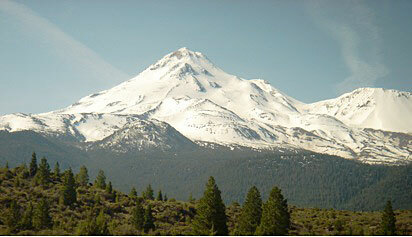 The dramatic crossing of the Cascade Range, far away from roads, can be enjoyed during daytime. Odell Lake sparkles in the sun. Once over the summit, the landscape suddenly becomes a rain forest, complete with ferns and waterfalls. Where the tracks reach Eugene, passengers on the southbound train are moving towards nightfall. Moving next door to the Pacific Parlour Car, reserved for sleeping car passengers only, we enjoy a quiet breakfast of quiche, Danish, and fresh fruit. This car is one of five that are unique to the Coast Starlights. Double-level carriages with glass curved towards the roof, they once ran on the pre-Amtrak Santa Fe "El Capitan". Redesigned by Amtrak, they feature a shelf of games and books, several overstuffed swivel chairs, curved upholstered benches with small tables to hold snacks or drinks, also used for food service, and tables with booths. The latter are available, with two menu choices, at mealtime. A curved standup bar invites you to place your foot onto a brass rail. Here coffee, soft drinks, cocktails, souvenirs, and wine are available. The atmosphere is one of an exclusive private club. Out the window to the west, the rising sun highlights the Golden Gate Bridge in the distance. Debbie, the car's attendant, is a lady we've ridden with before. "I used to work in the dining car," she reveals, "and I didn't realize how noisy it was there until I started to work in here. Next door, waiters shout downstairs, and the elevator clatters up from the kitchen. It's a high-energy car, with lots of animated passenger conversation. They use community seating, and this provides a great chance to meet other passengers, which can be a lot of fun." We agree. "But this is a quiet car, not a party car," Debbie explains. As if to prove her point, the sliding door between this car and the dining car open briefly. The loud sounds she'd described suddenly burst in upon us, almost as if they were inside a cartoon bubble. South of San Jose, broken sun beams play on the folded coastal mountains to the west. Filled with eternally fertile soil, the Salinas Valley has huge fields which are always plowed into perfect geometric patterns. Artichokes, strawberries, tomatoes, cabbage, Brussels sprouts and corn are just some of the foodstuffs that flourish here, although many fields now lie fallow in early December. There are lines of planted trees that serve as wind-breaks. This broad valley was formed by the Salinas River. While there are wide swaths of sands and flourishing trees in the riverbed, not much water is visible. It is hard to imagine the minor river carving out this big valley. The tracks are fairly straight here and run parallel to Hwy 101. The train easily reaches its top allowable speed of 79 mph, passing many of the speeding cars . One trucker has brought his dog along, and it enjoys leaning out the open window with its tongue hanging out while surveying our train. Orchards and vineyards come into view. The little valley towns, with names like Soledad and San Miguel, all seem to have a bar on the main street. Most sport a ubiquitous red neon martini glass, with a drunken stem. An overnight stop in Paso Robles, renowned for its fine wineries, provides a chance to visit our niece and nephew, who live across the street from each other in nearby Templeton. They take us out to dinner, and introduce us to Firestone Beer. At a pizza restaurant, we have a tasting to compare several of their brews. A predicted rainstorm arrives and a sign that warns, "Pick up your sandbags here" has appeared near the Amtrak station. "Look out to the right when you pass our house, we'll be watching for the train," nephew Greg says, hurriedly dropping us off. Greg, a railfan, has a backyard overlooking a wide, empty field skirted by the railroad tracks. We board #11 and pass through Templeton, and sure enough, he and his three kids are waving at us from their back fence. We head uphill towards the Santa Lucia Mountains and over the scenic Cuesta Grade with what the locals call Horse Shoe Bend at the bottom. Conductor Frank Bailey, a PTJ reader who recognizes us, comes by to chat. Very knowledgeable about Amtrak, and happy with his route between here and Los Angeles, he is optimistic about the rail corporation's future. Sylvia's dad once worked for the Southern Pacific here as a fireman on the streamlined GS steam engines, the ones that pulled the Southern Pacific "Daylights". 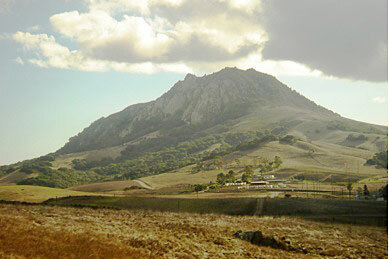 The town is surrounded by mountains, some of them part of a chain of extinct volcanoes, one of them named Bishop's Peak. Then #11 continues south into what the locals think of as Southern California. At Surf, the tracks meet the ocean. Views of the white-capped water, with many deserted beaches along the way, is enticing and exciting to see as we traverse the edge of Vandenberg Missile Base. We're out of sight of Highway One most of the time, so are able to have an exclusive look at scenery only visible from the train. Past the lighthouse at Point Conception, the coastline turns eastward. If the skies were clear we'd be able to see the Channel Islands now. Palm trees and dry arroyos are visible out the left side of the train. An abrupt change of scenery signals a cove that looks like something out of the South Pacific. Palm trees wave in the breeze overlooking Refugio Beach State Park. 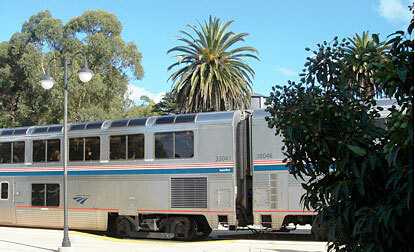 A stop at Santa Barbara's train station places the Superliner next to a huge ancient fig tree, its roots showing above the lawn. Hugging the coast for miles, the tracks eventually lead through the outskirts of Los Angeles. When the great cement-lined course of the usually dry Los Angeles River appears next to the tracks, it's time to get ready to detrain at the end of the line at Los Angeles Union Passenger Terminal.